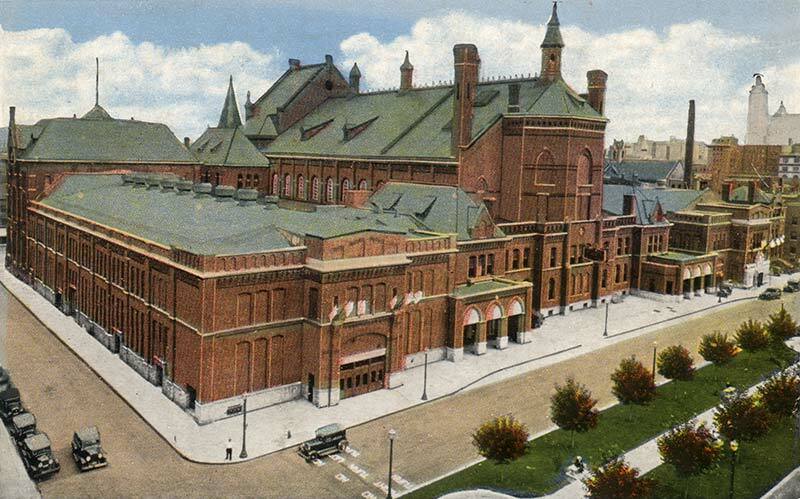 When Music Hall opened it was a simple structure, and more resembled a convention hall than a performance hall. 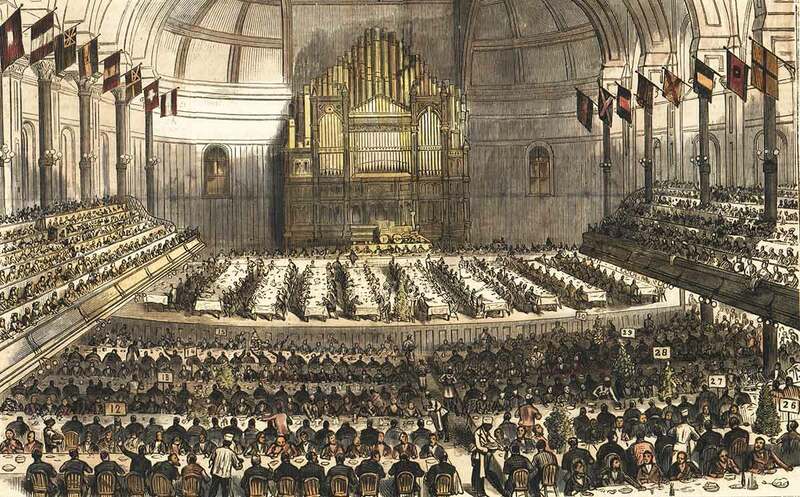 At the west end, the chorus and orchestra – together numbering nearly 800 – and the Great Organ. Most patrons sat on chairs arranged on a slight rake; others would fill the gallery that encompassed both sides and the back. A second gallery above that one extended only across the east side of the building. The grand vestibule was two stories, with the ground floor and gallery level both available for promenade. Above the vestibule was a small hall: Dexter Hall. In 1879, upon completion of the wings, both the north and south halls were two-stories, with smaller rooms on the third floor, east side. The south hall featured a glass roof. There hadn't been an exposition since 1888. Several music organizations that had called Music Hall "home" had moved elsewhere, including the Symphony and Orchestra Society. The wood walls and ceiling had grown dingy and dark from the dirt, and were a fire hazard. The heating and ventilation system was deemed "unsatisfactory." The slight rake of the floor, modified to accommodate both music audiences and expositions was not ideal for either use. Acoustics in the hall were poor. For this remodeling, Samuel Hannaford’s firm, now Hannaford and Sons, was hired to create a design that would remedy those issues. The renovation would better define an area for musicians, for a permanent symphony orchestra. The center building would be more suitable for opera and other musical events. 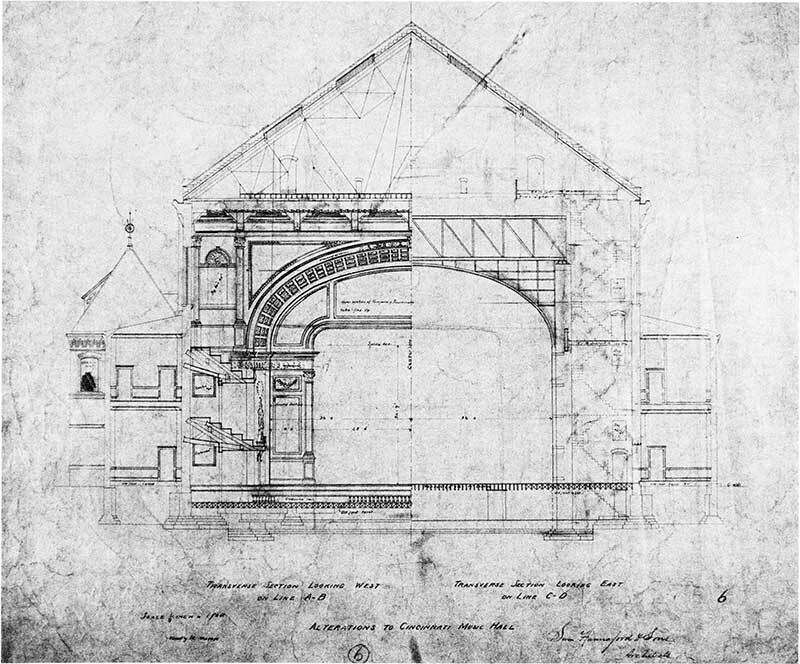 A permanent proscenium and arch were built. The arch was decorated by local artist John Rettig. 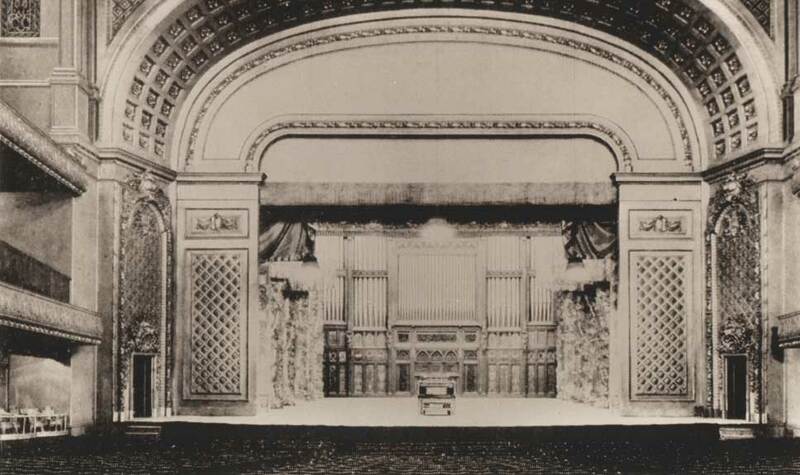 The proscenium was 72-feet wide and featured a curtain. The grand organ was pushed back against the west wall, 12 feet from its position. Stage production equipment was installed. Wood was removed from the walls and ceiling and replaced with plaster. Upper windows were permanently closed. The ceiling was lowered five feet and was coffered between the beams. A chandelier containing one hundred electric lights was hung from the ceiling. The floor pitch was changed although the level floor base was kept for exhibitions and conventions. The balcony was restructured and a gallery was added. Seats were purchased and installed. Electric lighting and steam heating were installed. The cost came to $130,011.31 - which was a third over the original estimate. 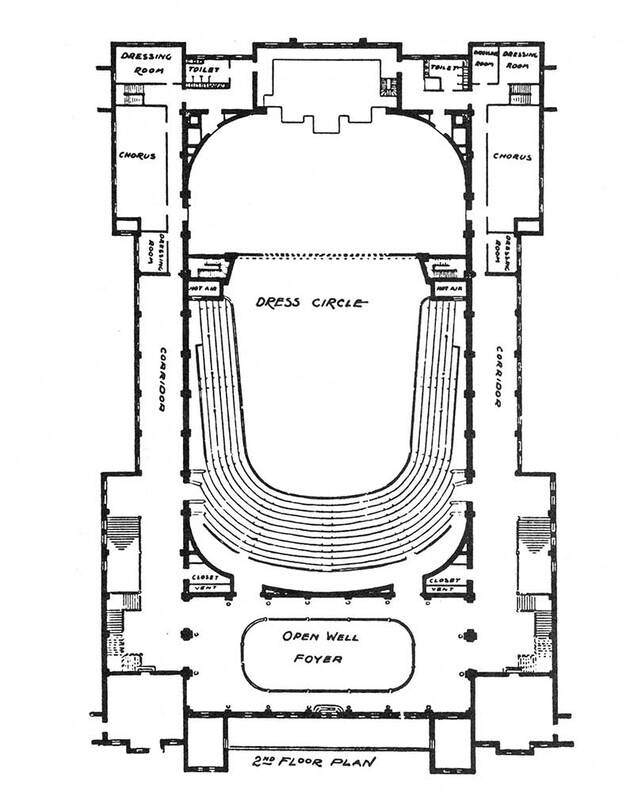 The cost overrun occurred because changes were needed in the ventilation system and extensive work was required to make the stage available to opera companies. New flooring was installed in the side corridors. Music Hall was rewired to comply with new building code. The work was completed in time for the Twentieth Biennial May Festival. In preparation for Music Hall’s Golden Jubilee and the Greater Cincinnati Industrial Exposition in 1928, the Board of Trustees decided to modernize the wings. 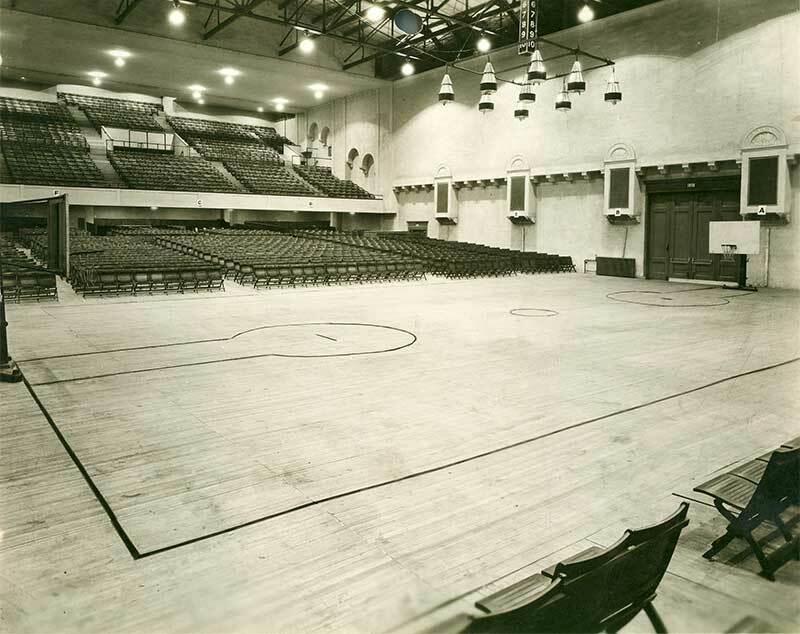 The north wing was modified to serve as one of the country’s finest sports arenas, seating 6,000. The wing could also still be used for expositions, following an overnight "transition." The south wing, which featured two floors, was reinforced. This would help draw automobile and home and garden shows on the first floor, and provide for social events in the ballroom on the second floor. The Central Parkway façade was remodeled and introduced as the new main entrance to Music Hall. Entrances to each wing were constructed. The mansard roofs and gables at the corners of the wings were replaced with parapets with low-gabled sections. This was more along the lines of redecorating rather than renovating. 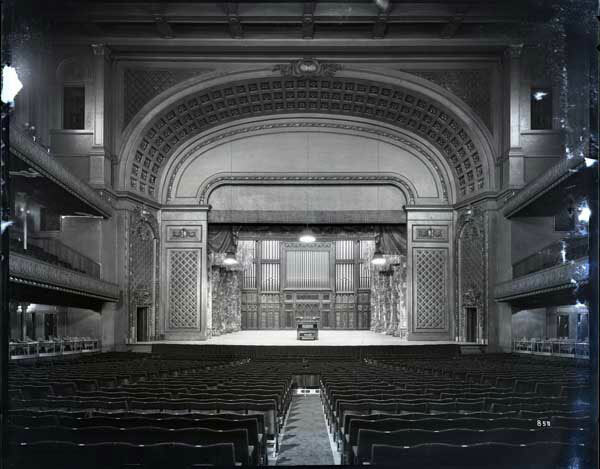 In the mid 1930s, with complaints about the poor condition of areas of Music Hall, many repairs were conducted, particularly those bringing the structure up to code. Following an earlier proposal to raze Music Hall, the interior of the buildings is redecorated, but there are no structural changes in the mid 30s. Music Hall got a facelift, and more. The work took over three years to complete. 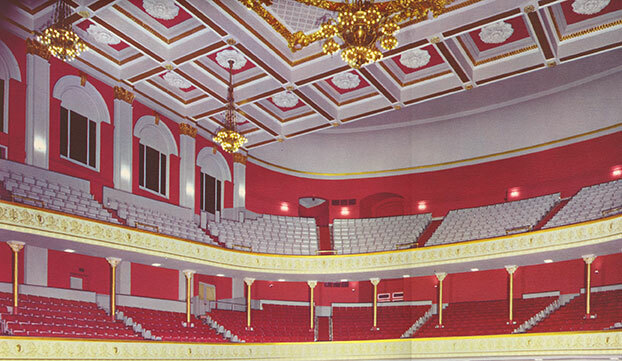 The auditorium was completely remodeled: ceiling and wall panels were painted in a red and grey color scheme, with ornamentation in an off-white with gold accents. 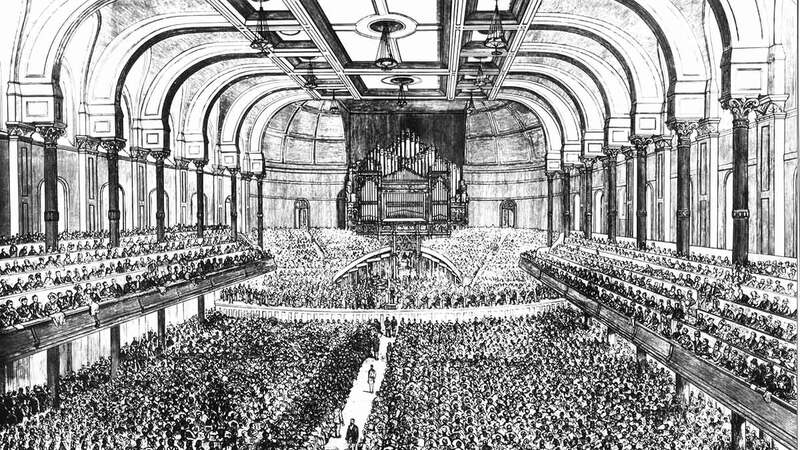 This resulted in an increase of the hall's capacity to 3,706 seats. The proscenium arch was repainted and accented in antique gold and re-lighted. A valence of draped red velvet was hung and five new stage curtains on double travelers were installed. The doors to the auditorium were replaced. Ceiling panels were accented in off-white. The columns in the foyer and upper promenade were painted in an off-white. Modern new lighting in the ceiling replaced the original lighting fixtures. Additional work included the installation of new plumbing and new electrical. Backstage, the fly gallery was re-roped and the new lighting installed on stage. All public places were redecorated in white, red and gold. New seats were installed in a new seating arrangement not only on the orchestra level, but also balcony and gallery. New lighting was installed, the highlight of which was a crystal chandelier. New Green Room, library and conductor’s suite were created along with additional dressing rooms. In 1970, the exterior was sandblasted. The stage was extended out into the audience for the creation of a lift that could function as an orchestra pit or state extension. New rigging and stage lighting were installed. 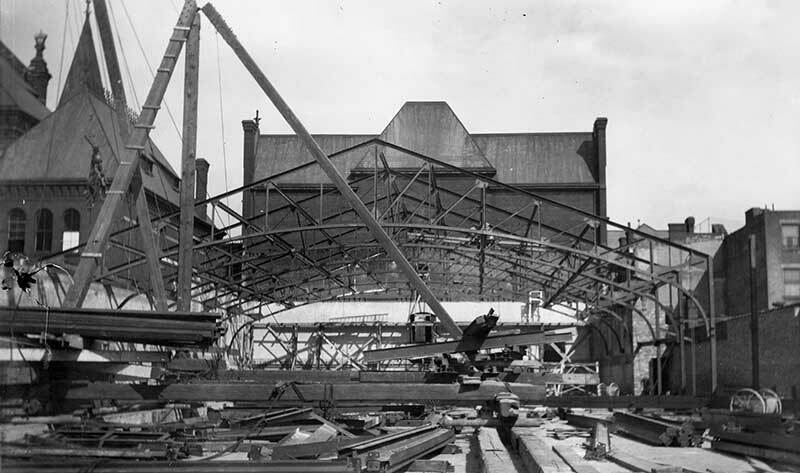 The sports arena in the north wing was dismantled and the space used for a rehearsal hall, carpenter shop, paint shop and scene storage. Dexter Hall was completely overhauled and renamed Corbett Tower, in honor of Mr. & Mrs. J. Ralph Corbett’s generosity and dedication to Music Hall. The south wing was remodeled in order to include the executive offices of the Cincinnati Symphony, Pops, May Festival, Opera and Ballet. Work started with the ceiling and walls, which were replastered and painted. Work completed during this five-year period was funded through the City of Cincinnati, State of Ohio, the Corbett Foundation, and the Society for the Preservation of Music Hall. The Ballroom was transformed into an elegant, state-of-the-art, multi-purpose room and meeting facility. In the north wing, a new headquarters for the Cincinnati Opera was created: the Corbett Opera Center. It included a reception area, box office, rehearsal room and administrative and production offices. Music Hall experiences its most extensive renovation/revitalization - ever. New greenery and paving decorates the plaza facing Elm Street. Black-brick banding and patterns have been restored, as originally designed by Hannaford. A new street-level ADA compliant entry has been installed. The Rose Window has been repainted to the color specified by architect Samuel Hannaford. New street-level box office can be accessed at 1241 Elm Street. Modern, high-speed, high-capacity elevators reach all floors. A Gift Shop replaces the Music Hall Box Office. Audience lounge off the Grand Foyer with a monitor showing a live feed from the auditorium, and food and drink. Latecomers will be comfortable here until they are seated. Five new permanent service concessions have been added. A new high-speed escalator will reverse directions after concerts. Women’s restrooms have more than doubled in number and accessibility has been improved. And there are twice the number of family/unisex restrooms. The Edyth B. Lindner Grand Foyer has opened up with the removal of the glass doors at the north and south ends. The coffered ceiling and plaster rosettes remain, but have been painted in the new colors of cream and taupe. Additional light fills the area, as the outside awning has been removed and new torchiere lights installed. Each entrance to the auditorium has a sound-and-light-lock doorway. The side and back walls of the auditorium have been pulled in and are rounded at the back on the balcony and gallery levels. The balcony and gallery have been re-sloped, feature uniform steps and new railings, and supports have been reinforced with steel. Box seats have been reconstructed. Walls and ceiling coffers are painted in the new color scheme. New natural hardwood floors have been installed. New seats are wider and there’s about an inch more legroom. Accessibility and sight lines have been improved. The world’s largest orchestra library now has high-density, protected storage. The orchestra pit has been made accessible. Reclaimed space is now a musicians’ lounge. An additional loading bay has been added. The Cincinnati Symphony Orchestra and May Festival have new offices, including a second floor mezzanine. New offices for Cincinnati Arts Association personnel managing Music Hall replaces the old Critics’ Club. Office space has been provided for SPMH. A carriageway has been repurposed to become a small meeting room/reception area. The space includes a small kitchen area, dedicated restrooms and AV capabilities. The room also features refinished art-carved panels from the original Hook & Hastings Organ. A second rehearsal hall has been created on the second floor of the north hall. The floor is made of material that can be used for dance. Windows in that room have been opened up. The drop ceiling has been removed and the original cove ceiling has been restored. Stenciling discovered high up on the walls and ceiling has been reproduced in the original colors. Arched tracery windows above the three existing windows were uncovered and restored. The room has been painted and new carpeting installed. The catering area has been improved. The size of the ballroom decreased slightly.